After having enjoyed the beauty and fresh water of Lake Alpine on Monday and the depths of the Mercer Caverns on Tuesday, on Wednesday we headed to the South Grove of Big Trees State Park. But not just any big trees. 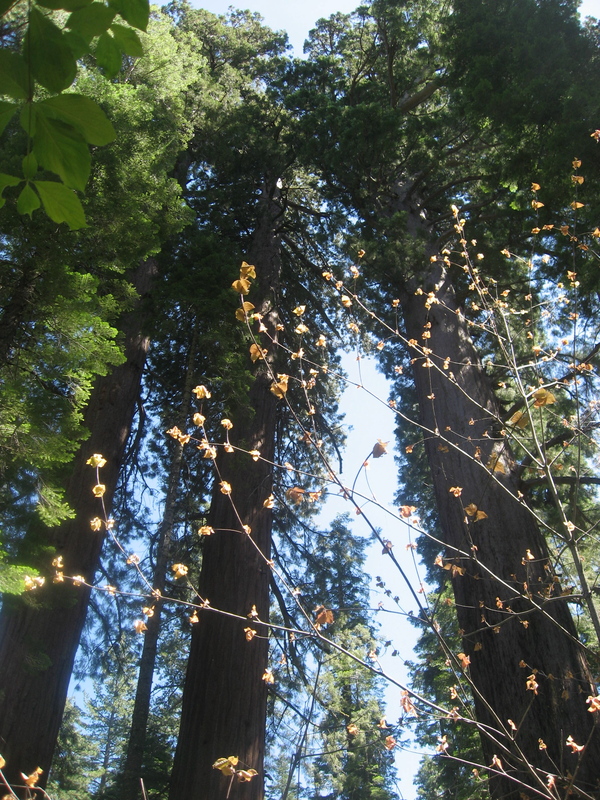 These majestic beauties are some of the last of the Giant Sequoias, and what amazing gifts they are. I’ve been to Muir Woods several times over the last few years, and those trees have a beauty of their own, but, at the risk of sounding “new age,” they don’t have the same… energy that the South Grove has. (Perhaps that’s due to Muir Woods’ close proximity to Bohemian Grove, where, according to Alex Jones, many evil activities are said to have taken place.) South Grove is different. It’s not easy to get to the South Grove, I think purposefully. You know already on the curvy 9-mile drive past the park entrance just to get to the parking lot, winding your way down one mountain, across the Stanislaus River, and up and down another mountain, that you are venturing into territory that is not often charted, hidden away by the pomp and circumstance of the famous sequoias in Sequoia National Park to the south. Then it’s an upward mile-plus walk from the parking lot just to get to the actual South Grove Trail. It was worth every dusty step. Each tree pointed out in the guidebook had its own individuality, its own story. Most of the 2000-3000 year old trees had burn scars from the various fires that had come through the forest at one time or another over the millennia, some of which had created little hollows where I could envision little Allerleirauh hiding for the night and then being discovered by a kind king in her Grimm fairy tale. But what struck me most about the trees was not their incredible girth (the kids’ bedrooms could have easily fit into the largest, the Agassiz Tree), nor the way they towered 250 feet above, nor the softness of their bark (which is, incidentally, fire-resistant). What silenced me was the spirit of the forest. This was hallowed ground. Each Giant Sequoia had a palpable energy that seemed to say, this is sacred ground. You may heal here. Breathe in all that you can and take it back with you to your crazy city life. As my friend, Kathleen, and I like to say, Whoa. This was tree-hugging at its greatest moment… not literally putting my arms around a tree, but even better. This was being enveloped in the sacredness of the trees’ spirit, their rich etheric body that has not been burned the way the trees have physically. Within its embrace, I could feel the holes in my own war-torn, battle-scarred ether begin to close. When we got to the end of the trail at the Agassiz Tree, one of the largest in the world, and had appreciated its size and splendor, had filled up our water bottles in the nearby Big Trees Creek, and had taken our family photo, I asked Mark-Daniel and the children to give me a moment with the tree, that I would meet them back at the next big tree. “To think,” I told them. Truthfully, I wanted to soak in the energy. I wanted to close my eyes and savor the moment to take back with me into the craziness that begins next week when I go back to school full-time. All the hugs I’ve given out over the years, especially to my children, and I realized that I just needed a moment to receive. The trees gave, I received. When I could feel myself giving back in an unbreakable circle, I knew it was time to go back. How grateful I am that in my times of personal torture, if my pharmacology professor were to start dissing herbal medicine, if the kids were to get fevers before a big exam, if traffic were to tie me up in knots, that I can always go back to this sacred place. I can feel the spirit of the trees surround me. omfg. so beautiful… Big inhale…big, gigundundamundo exhaaaalllle….. Big trees rock. I love this. I love you. ultimately refreshing and healing walk on that Wednesday, August 18, 2010.